Trimensional powers the latest iPad app from Popular Science: PS Evolver. 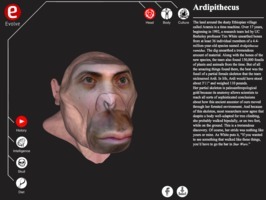 Scan your face to create a 3D model of yourself as Homo Erectus, Neanderthal, Australopithecus, and five other hominids. Today. 4 million years ago. 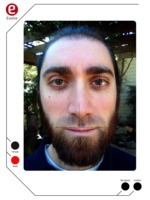 I got a phone call out of the blue earlier this year about using Trimensional's technology to show what a person would look like at different periods in human evolution. At the time I wasn't sure it was really possible, but I was willing to give it a shot. Fast forward a few months and this fanciful idea is now available as an iPad app from Popular Science called PS Evolver, about which you can read more at www.evolverapp.com. 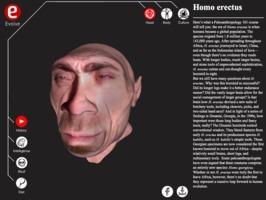 The results are incredible and the first time I saw myself as Homo erectus, I was blown away, and a little frightened. The key to making this possible was an insanely talented paleoartist named Viktor Deak whose work you may have seen before on Nova, National Geographic, and BBC documentaries. Together, we came up with a process for modeling 3D heads so that a Trimensional scan of a modern human face could be mapped back onto a number of prehistoric skulls. 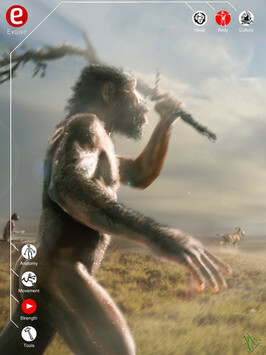 The app is also filled to the brim with the latest info regarding hominid species like Australopithecus and Neanderthals, so it's a beautiful, informative app even without Trimensional's contributions and I encourage everyone to check it out. PS Evolver is available for iPad only on the App Store.